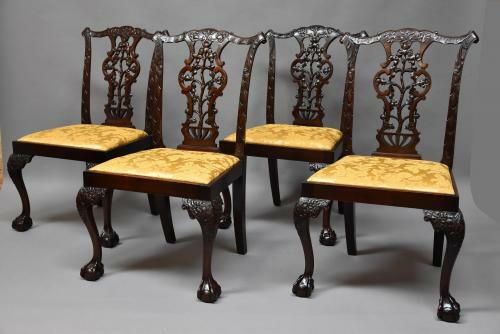 This set of dining chairs consist of finely carved mahogany backs with a shaped top rail carved with scrolling foliate designs with superbly carved open splats with intertwined acorn and oak leaf decoration, the uprights also with foliate carving. The drop-in seats are all upholstered in a gold fabric in very good condition (just one cover with a small mark) - these could easily be re-upholstered once purchased in a fabric of your choice. The front legs are of cabriole design having superbly carved decoration of acorns and oak leaves to the top leading down to a ball and claw foot, the back legs being of splay design. These chairs are by the cabinet makers Charles Baker of Bath having the ivorine plaque to the underside 'Made by C. Baker, Chippendale House, Wells Road, Bath'. Charles Baker (1841-1932) was part of an important family of cabinet makers from Bath working in the 19th and 20th centuries. His workshops, Chippendale House, were suitably named as the company was renowned for recreating designs from both Sheraton and Chippendale. Charles and his brother William were both trained by their father in chair making, Charles establishing the business at Chippendale House in 1888 and working there until his death in 1932. His work was highly appreciated at the time due to the quality of workmanship and carved detail. This elegant set of chairs are all in excellent condition for age, are all of stable construction and can go straight into a home.